Advertise your custom message on Mood Bracelets, Sun Fun Bracelets and Nite Glow Silicone Bracelets. 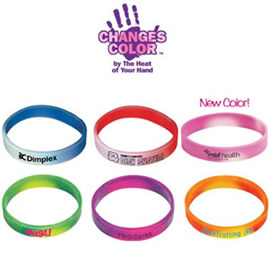 Many color possibilities are available with these silicone wristbands. Mood Bracelets change color with the heat of your hand. 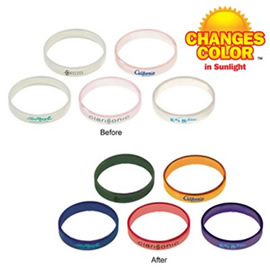 Sun Fun Bracelets change color with sunlight. Nite Glow Bracelets glow in the dark when activated by exposure to light. Mood Bracelets are available in blue to white, red to white, purple to pink, green to yellow, orange to yellow, pink to white. Sun Fun Bracelets are available in frosted to green, frosted to orange, frosted to blue, frosted to red, frosted to purple. Nite Glow Bracelets are available in Nite Glow. 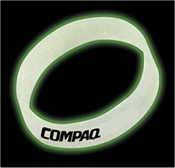 Size of all Color Changing Wristbands is 1/2" high x 7-1/2" circumference. Imprint area is 2-3/4" wide x 1/4" high.